Issues in bioethics often turn, at least in part, on the law and regulatory requirements. Consisting of chapters that address particular bioethics topics from the law's perspective, this fascinating book includes:an introduction to the American legal systempapers identifying the principal ways in which the law influences discussions and decisions concerning each of the topics highlightedsupplemental papers on certain areas that address the influence and status of the law in countries other than the United States. Covering traditional topics in bioethics, such as determinations of death and health care decisions for vulnerable groups, this study also explores emerging areas such as conflicts of interest in research, genetics, and privacy and confidentiality in the electronic age. 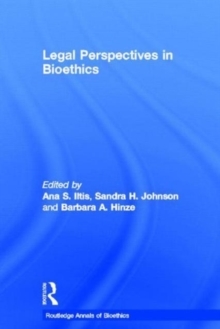 Incisive and thought-provoking, this volume provides readers with a rich context for understanding the intersection between the law on bioethics and the central issues in bioethics.